My car may have been a lemon, but I had issue after issue with my 08 Outlook. GM actually extended our warranty after we filed lemon law paperwork, which at least helped with the numerous costly repairs it needed. Oil leaks, fuel tank replaced, cylinder heads, power steering, A/C repair twice, and more. The XR model was comfy inside, however, and spacious enough for 3 kids and 2 dogs. GM does not care about its consumers. My Outlook needed a new transmission for $5000 (a common problem from a faulty wave plate) and it should have been recalled. Also replace countless other items worth probably an additional 2500 in repairs including new front struts, alternator, gauge cluster and oil cooler. I was stupid to buy this vehicle as before it I had a Hyundai with 150k on it that never required one single repair! too many issues similar to the other consumers here... although I bought the vehicle used summer of last year, transmission was replaced (shortly after I bought it.. luckily I bought an extended warranty on it which covered about 2/3 of the costs.. ), acceleration (or lack of...), rack & pinion needed to be replaced this past summer, water pump, alternator/starter, electrical issues.. in other words.. I think you can use the word "Lemon" in this case and it sounds like the same for others posting their comments here as well... if this is what the GMC Acadia is like since the Outlook and the Acadia are similar in parts, service , etc. , I am going to steer away from GMC!! This past May I had my transmission replaced for the second time within three years. Since May I have had to take my car back to that same shop three more times and now my starter just went on me. This car has given me nothing but grief and if I didn't owe more on it than it was worth it would have been traded in by now! I am absolutely done with GM. Unfortunately, I may be done with American cars period at this point. -25 f, 2 hours away from home, 7 pm at night, two kids in the car, and treacherous road conditions ~ transmission fails! This problem is widespread & it isnt hundred of cars affected, its thousands and probably tens of thousands . So far GM is doing nothing ~ apparently it takes people dying to issue major recalls, and even then it takes many years and investigations by various agencies. UNACCEPTABLE and CRIMINAL ! I will certainly jump on the class action lawsuit wagon, if it exists, or when it does come to fruition. This is certainly the LAST GM product I will EVER buy! Furthermore, I will take to social media so I can to tell my story and make sure others know about these cars! TRANSMISSION NEEDS TO BE RECALLED!!!!!!!! Sudden acceleration, hard shifting, not catching gears, slight hesitation when shifting gears is a few. It would usually work fine after pulling over and restarting the car. As time went by the car would not go out of first gear at times. It never lasted long enough to get it a half hour away to GM. I attempted to and by the time I arrived the light went off and it would be fine. Months later we had to have it towed in. AT 84,OOO MILES! two weeks later I received a call telling me what I already knew...that the 35 WAVE PLATE and VALVE CONTROL MODULE in my transmission needed replaced. Same problem EVERYONE IS HAVING w this car. Its a major flaw that needs to be RECALLED!!!!! In the past 4 months I have replaced two engine mounts, bushing, power steering pump and week later the transmission needs to be rebuilt (it is stuck in low gear and won't go in reverse). I have also had to replace the throttle body. Stay away from this car at all cost! It is a giant money pit! Over all car is "okay". Transmission has serious problems. Had to be rebuilt at 58k miles, control module replaced at 111k, speed sensor at 115k, and now looking at another rebuild at 141k. Vehicle is unreliable and I would defiantly not recommend it. GM quality is long gone, never buy another. Our 2008 Outlook has 46000 miles on it and we are having to have the engine torn down. The dreaded timing chain problem that GM claims doesn't exist in the 2008 model DOES EXIST! For some crazy reason GM has extended the timing chain warranty on every other year of this vehicle except 2008. Our last GM had cronic problems as well but not this bad. Honestly I love the vehicle but GM has lost this customer. I am so disgusted. The Outlook looks very nice. This is the reason my wife and I decided to purchase this vehicle. We didn't know they had lots of problems. Have had wheel bearings go bad at only 65,000 miles. Have leaks around the sunroof, back rotors replaced, various exterior lights not working, and now at 74000 miles the transmission is bad. This is very common with this vehicle. Buyers beware, do plenty of research first. I'm only writing this to help others out so they don't find themselves in the same situation I'm in. Go with a newer Ford or Honda --- trust me. You don't want a vehicle from a company that had to get the bailout. Just recently having transmission trouble. The problem is that it will not engage into drive or reverse. It just sits and revs up in any gear. I have not did anything with the car yet. Hoping someone can help me contact G.M. and get some help as I cannot afford the expense that most others have went through to get the trans fixed. The Outlook looks great inside and out, unfortunately mechanicly the vehicle is garbage. I have spent more money in 11 months of ownership on my 08 Outlook than I have in my last three vehicles combined. My next SUV will be a non GM product. I have been a loyal General Motors customer but that might have to change after owning this vehicle. I really like the design of this vehicle inside and out. My main complaint is that it has major problem after major problem. The only good thing is that so far everything has been under warranty. The first thing to go was the rack and pinion at 30,000 miles. At around 35,000 miles the right strut started leaking and had to be replaced. It started leaking again at 60,000 miles, I dont know if its bad luck for me or a design flaw. The next thing to go was the water pump at 50,000. Finally at 68,000 miles the transmission went. Thankfully it was still under warranty (with only two months to spare) and the dealership had to replace 3rd, 5th and reverse gears. Overall this has been the most unreliable vehicle I have ever owned. I would never recommend this vehicle to anybody. All owners appear to have the same main problems and I cant believe General Motors doesnt offer some type of buyback program as they did for the Vue. I previously owned a (used) 2002 Nissa Altima that gave me all kinds of hell. I decided to buy American and thought Saturn made good cars. This car has proven me wrong. In the 4 years I've had it, (purchased in 2008 - original owner), the car has overheated twice. Check engine light came on 3x. I've had to replace an engine solenoid valve, temp sensor and H20 pump and fix a leaking transaxle. This morning I received a stability trak DIC. So off to the dealer I go again. This car is a big piece of junk! Pre-own buyers beware!! This has been by far the worst car we have ever owned. The transmission was completely replaced under 50k miles (shuttered all the time). The lift gate struts broke. It over heated with thermostat problems at 25k miles. The AC randomly speeds up and slows down. The front headlamp assembly melted causing the headlights to go out ($700 if not under warranty). The dash computer went out causing the dash to go out. The remote start has never worked... dealer has never been able to figure that one out. And the kicker... the sunroof drains into the floor on the passenger side. Sometimes when it's raining and I hit the breaks, water flies from the headliner onto the dash. I will never buy a GM. DO NOT PURCHASE THIS VEHICLE !!! Best car we have owned...highly recommend! 1st of all...we highly recommend buying your next car at CARMAX [violative content deleted] What a great, fun car buying experience! As for the car, easily the best car we have owned! We have/had Honda Civic, Nissan 300 Z twin turbo, Jeep Grand Cherokee, GMC Sierra Truck. This car drives like a dream! Safe, quiet, responsive, functional controls, kid friendly, seats reconfigure effortlessly...what more can I say?...we got it at a great price at CARMAX too! If you are looking for a SUV/mini van capacity, with performance like a sports sedan...then look no further...this is it! Satur Outlook will be less expensive than GMC Acadia (even though they are both the same car)! By far the most comfortable car I have ever owned. An SUV that handles like a car. 60,000 miles and had only one engine problem that was taken care of by GM dealership at no charge due to 100,000 mile warranty. I can't say enough good things about it. My Brother owns the same year Pathfinder and I like my ride a great deal more. Wow! I have 95,000 miles on it and never had any problems. Great car! Best car for the money. Basically wife gave me a list of what she wanted (Navagation and DVD) we found this one at the local dealer has all the bells and whistles and overall has been excellent Vehicle. we have had for 2 years and have 62,000 miles had to replace the rocker arms, DVD had quit working had extended warrenty replaced unit. didn't check the onstar when we picked it up and week are so later when we checked it found out the quote the onstar computer has quit working and even though it goes thru the radio they are sure that changing had nothing to do with it, not a problem new onstar module only 850 dollars. The DVD/Stero was over 1200. I like saturn but cant trust the GM dealer's service so Addios! Best vehicle my wife and I have ever owned PERIOD. Absolutely no trouble, and the dealership outstanding. Never had anything like this dealership, car was washed at no charge after each oil change, tire rotation. Still take car there for maintenance even thou they were forced to be a dealership for Hyundai, which I will never be able to purchase, because I am AMERICAN! We like the looks and it is comfortable. But it has been in twice for a leaking sunroof. It also has had a transmission leak, shock absorber leak and bad bushings. This past week it was back in and needs a new starter and power steering pump. It has had work on the transmission and electrical issues, warning that the hood was open and irregular tire pressure readings. The slightest hill causes it to downshift. On the highway, I have gotten up to 25 mpg so that has been good. I pulled into the Saturn dealership in my Sienna just to see the Skye parked out front. I couldn't wait to get rid of the minivan but still had 5 months left on the lease. The salesman asked if he could get me out of my lease for no additional cost would I be interested? Sure, why not. I ordered an Outlook XR AWD loaded with every option. As a long time fan of Honda, my Toyota minivan was a big reliability disappointment. I've always hated GM since the 1980's when they built really crappy cars, but I feel the Saturn brand really had the right approach. I love this car! They really got it right, unfortunately a little too late. Drives well, solid, quiet, no problems in 2 years. Best car I have ever owned. Saturn (sorry to see them go) makes one hell of a quality car. We have had a 2000 L300 which we sold after 1 year only because my wife has a lead foot and thought she was "Mustang Sally", a 2004 VUE and now a 2008 Outlook XE w AWD C. There is really nothing bad I can say about them. We do/did not put more than 2,500 to 3,000 miles on these cars because we have another car that we use for tooling around town and use the Outlook and past Saturns for road trips. We have two dogs that require cages when we travel and there is plenty of room in the car for them and all of our luggage. Best investment I have made was buying Saturns & especially the Outlook. Great car!! I have a 2008 Saturn Outlook and recently had some major leaking problems (like having to hold a cup to catch a lot of water!) I turned the corner and my car sounded like a bucket of water sloshing from side to side. That same evening, water started leaking through all the seams in the front of my car (ie: the airbags on the side columns, the 3 buttons used for remote openers, my visor and the emergency brake area etc... ) I also had warning lights and alarms going off because there was water in my electrical system! I had the car towed to the Saturn dealership and they claimed it was a problem with the drain flaps. I don't have room for more. Check out Edmund's Forums for my full post. I've had the car for none months now. The mileage is getting better as the car wears in. We started off getting around 17 MPG, but we're now averaging around 20. We have the FWD, so that makes a difference. I still think this is a great vehicle and I'd recommend it. This is my first ever American car. I have been accustom to high end European cars as I enjoyed their speed and performance. I decided to add the Saturn to my list and I have to admit, the ride is smooth, quiet and very comfortable. It has all the bells and wistles I need and more space than I can use. There is a delay in acceleration which is tolerable for now. The fuel consumption is good compared to my RR which I am giving up. After a month of driving the Outlook, I now find my 5 series and 996 a little too rough to drive. I feel a road trip coming up this summer! Look-out for the Saturn Outlook! We've had our Outlook XR for almost 9 months now and have never had a problem with it. It is very spacious and comfortable inside. The exterior design is bold and aggressive. (Especially with the Carbon Flash finish and 19" wheels.) I would recommend this vehicle to anyone with a large or small family like ours. Even small families need extra room at times. I can't wait to take it on vacation to Florida. Don't pay too much attention to the negative comments and problems that owners have mentioned on this site. Sure, some are warrented but, there are many, many more owners that have not had problems and love their Saturn Outlook. 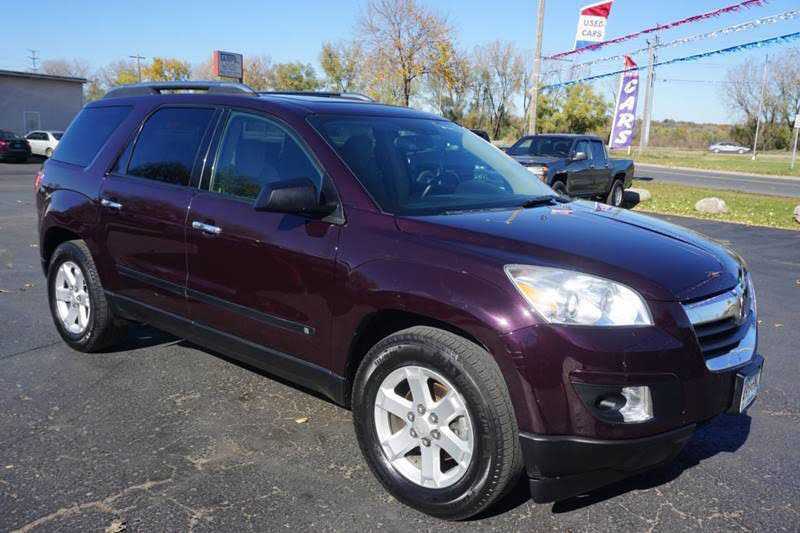 Bottom line is, this is an awesome Crossover SUV! At first we loved this car, then the problems started. I've had it in twice for doors leaking from sunroof drain tubes, going to take it again soon. Seats are ruined from water damage. Have had the strut mounts replaced, windshield wiper blades recalled, can't seem to get the popping noises fixed underneath. We are very upset, also the car won't even make it up our driveway because of the gravels. It stinks for a front wheel drive! wish we never traded. I feel like we have been cheated. This car is a lemon!! 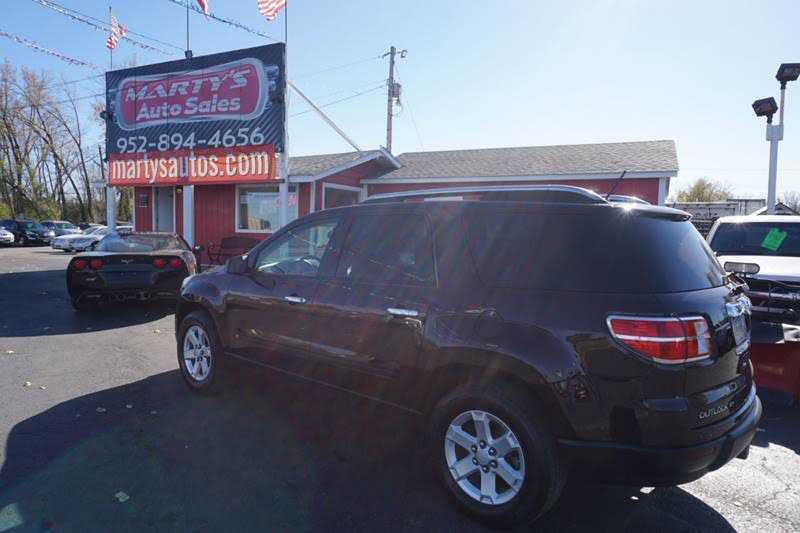 We were looking for a lot of vehicle at a reasonable price, and we found it with the Outlook. The vehicle is not getting the great mileage we desired (around 19), but the interior space more than makes up for it. We fit five adults and two child seats in the car and everybody had enough room. It handles well in rain, but high winds will surprise the new SUV driver. We did a lot of research before buying this car. We have always been a Toyota family. We saw the Outlook and decided it was a match for us. We have had air conditioning issues since the second day we had the car. The air, when it is hot outside, will blow hot air. It kicks on and off doing that. Had it to the dealer 3 times for fix. They had to replace the entire control console. Then we had the car flooded 3 times because the sunroof is leaking. Terrible design allowing so much water to come into the car leaking from the sunroof. The transmission also seems to lag when shifting gears. We have had the car in for repairs a total of 8 times in 6 months. Toyota we will be back soon! We bought our Outlook in August 2008 (traded in a BMW 330CiC). We bought it for it's HUGE interior and cargo space as well as it's seating for 8. No other vehicle can compare within it's class. It drives great, get's decent fuel mileage for it's size, and is very comfortable. We had our first "big" snow here in DC a week ago (6-10) inches and my wife was hesitant about driving the Outlook in the snow. We have owned other SUVs in the past and snow was not their strong suit. However, this thing was like a snow plow. No slipping, sliding, or any problems. She loved the fact that she didn't have to "do anything" because it is AWD. Great winter vehicle!! Poor quality returns to GM. My 40k car is in and out of the shop every 90 days with recalls, electrical issues, and power steering and other problems. They have covered everything but not my time. Service says the first 9 months they had build issues....I wanted to buy domestic to support the cause and what I got was a UAW Union American Waste of money. I feel bad GM is going under but bad products deserve to fail. Go buy an american built mercedes and avoid the hassle. I love this SUV. I test drove MDX, Highlander, Pilot. This beast outperforms all of them in all fronts. I am very particular about every thing. This things gets good score on every thing. Interior is clean, easy, functional. Door paneling is excellent. Seat design and comfort is top notch. Better than MDX. Body fit and finish is great. Ride quality is great. Perfect balance of handling vs ride quality. Noise must be around 72 decibel at 70 miles. Curious if it gets even better with top quality tires. Back of the seat liners need better upholstery. Cup holders should have slots for mug handles, head rest position should be adjustable like BMW. We buy a new truck or car every year since 1996. We purchased the v6 ho engine and we have every option plus we had dual DVD units dealer installed with a little known headrest available option. Grandchildren can sit in the rear buckets and watch the same movie on each unit or different movies with wireless head phones. We immediately left southern Oregon to Boise then Utah, Wyoming, Colorado and so on all the way to Louisiana. We never reset the trip meter the entire trip just filled it up. When we arrived, the dash unit read 23.5mpg I was thrilled. We are temporarily in Louisiana on a project and for 6 months the car gets 12.6 in town, bad. Leather seats are 10. Had 07 Explorer loaded, can't match. I have been told by the GM that there is a "ghost" in my car - he even went to bat for me with Saturn and they will do nothing - the control panel has constantly got a warning: air bags, tire pressure , ice on the road: none of which are true! The transmission bogs and surges uncontrollably, stereo, dvs, navigation work randomly - wanted to get out of the mini-van phase - BAD IDEA to do this with a Saturn! Onstar has told me to take my car in for service immediately - my air bag could or could not go off anytime. My families safety is far more important - Toyota I'll be back.And to top it off no light in the glove box. DON'T WALK RUN FROM THIS NIGHTMARE - LOOKS AREN'T EVERYTHING! This is without a doubt the most comfortable vehicle I've ever owned. I took a trip, drove 18 hours straight and got out of the vehicle with no back pain. The whole trip was relaxing. The Outlook handles great on snowy, slushy roads. I would recommend this vehicle to anyone. The Outlook is my very first automobile purchase, and I absolutely love it. The ride is very smooth and if you're not paying attention you could easily hit 80-85 mph. So, cruise control definitely comes in handy. I spend a lot of time on the road so it had to be comfortable. I get 20 MPG which isn't bad, but it could be better. This vehicle is really fun to drive, and the White Diamond is beautiful.I would definitley recommend this vehicle. I bought a Saturn and... wow! GM really did its customer research when they built the Saturn Outlook. We have now had our Saturn for 1 1/2 years and we remain extremely satisfied. In addition to wonderful build quality, the interior design is outstanding. I am 6' 1" and my 13 year old son is well on his way there. With the second row captains chairs, he and I can comfortably and easily get into the third row seat, far easier than any other vehicle we tried. A great surpise: After changing my flat tire (which was quite easy) I found that Saturn had put a large plastic bag in a storage area so that the dirty damaged tire could be stored in the back so as not to make any mess! Wow! Very nice touch! Did a lot of research when buying my first new car. Looking for a reliable car to go on road trips. (loved my two used Suburbans I had previously) Poor gas mileage. Get 12 in town averaging 15 mph/19 on the highway 53 mph. Took it in twice- Mechanic says I'm getting 16/22. It broke down out of state. Had to have computer replaced at 2000 miles. The passenger seat bottom had to be put back on. Can't get used to the small window in the rear hatch. Can't see distance to back up/park. Frustrating. Now I am anxious about going far from home for fear it will break down again. Defeated the whole purpose of a new car! I realized in the 1st tank of gas that I wasn't getting the MPG that Saturn told me I would get. The vehicle is rated at 16 MPG city but we struggle to get 12. It would be different if the vehicle was driven hard but it's driven very slow in a fairly small town that you don't drive over 35 MPH. I've had the vehicle back to 2 Saturn dealerships 4 times and they can't seem to figure out why it gets the poor mileage. The last Saturn dealer told me they drove it and got over 16 MPG. I offered to ride with them to verify their claim and they refused. My wife loves the vehicle but if I knew it was going to get 12 MPG I would have bought another vehicle with a V-8 engine. This car is without a doubt to me, the best car for a family currently on the market (for those who are non-minivan lovers). 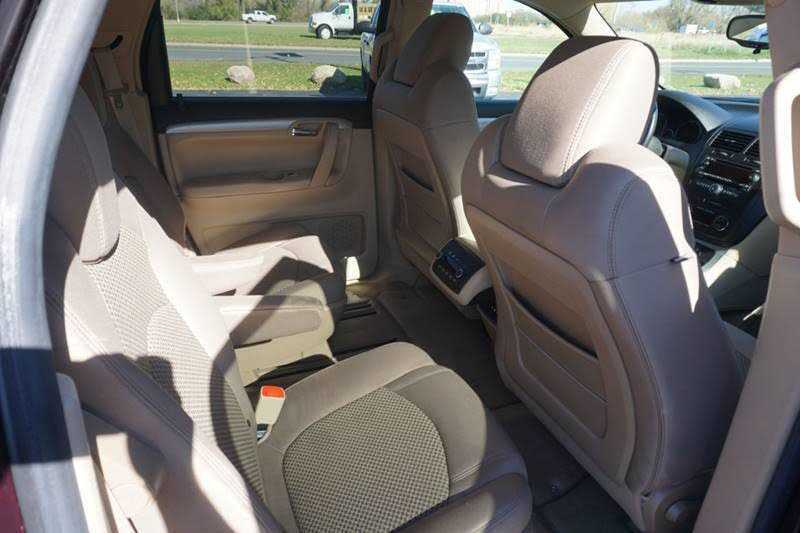 The driver and passenger feel like they are in a luxury car, while the kids feel like they are in a roomy minivan-like environment, with a DVD player, 110V outlet for the x-box, and easy in and out due to the lower than most SUV's ground clearance. Our 3 year old can easily get in and out himself. Overall, it's a fantastic car that is fun to drive yet has all the features that a busy family is looking for. I've owned my Outlook for 14 months and have had several problems. Transmission leak in 9th month of ownership; two "repairs" on leaking sunroof and now an oil leak. Love the car otherwise; MPG is around 18 City. I'm selling it - a car this expensive should not have transmission problems before a year is up! I love my Outlook XE. It's just fantastic. The only downfall is the gas mileage. I truly believe I get 24 miles to the gallon on the highway but the city mileage is questionable. I think if the gas mileage improves in upcoming models this vehicle will be the crossover of choice. At least it is for me! Yes that is a Saturn! My wife has been wanting a new Outlook since the first time she saw it. After driving it, so did I. Great riding vehicle. So much space for a midsize SUV. This car can definitely compare with any other SUV in it's price range. If you're looking for a vehicle that will keep your kids content on a long trip, trust me, please put the Outlook on your list. The hardest decision will be deciding which color. Overall owning the Outlook hasn't been too much trouble except for the sunroof leak which has been present ever since we've had it. It's been back at the dealership a total of 3 times, soon to be 4, and it's still leaking. Other than this little problem, no issues. We love our Saturn Outlook! It's comfortable and we've had no problems at all with it. We're in the market for another new car and we're realizing how great of a job GM did with this vehicle. 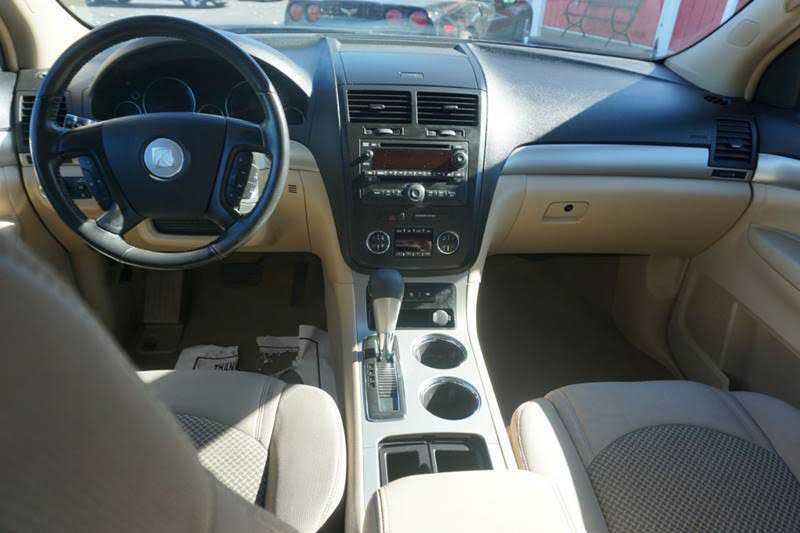 The nav system is top notch and we also really like the stereo system and overall interior design. The car drives well, has good pick up and can carry 7 adults without any problems. I love our new Outlook. It is perfect for our family. I love the seats and the option to have 8 in the car at once. We have 3 kids who actully don't mind being in the middle seat together. It is very roomy. Recently purchased the Saturn Outlook XR AWD. Special ordered the Ocean Mist with Gray leather interior. 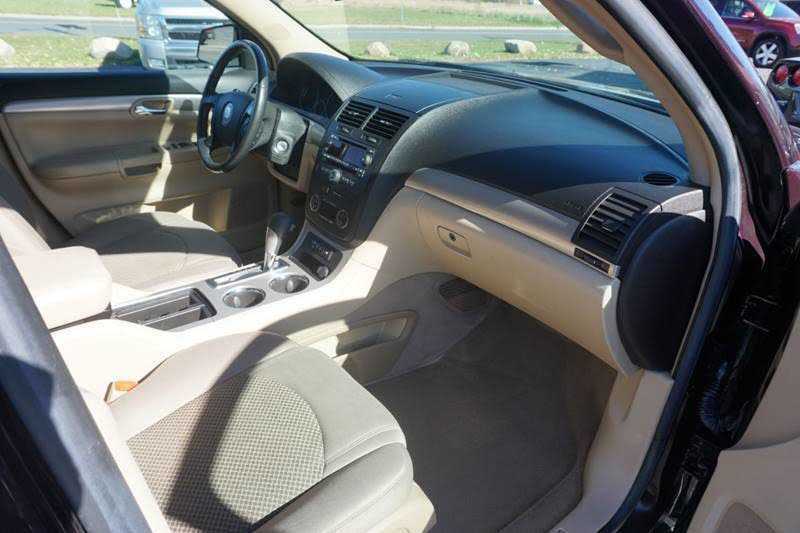 Drives smoothly and very comfortable and spacious for family of five. Looked at Enclave and Acadia as well and with same options Saturn is a better deal dollar for dollar. We have the same options as the Acadia SLT-2 for $1500 less. We needed a car that could carry 6 kids plus stuff and tow a boat and we didn't want a monster SUV. The Outlook is exactly what we needed. It carries all of us and our gear comfortably. Mileage isn't great, but it's not a compact and we knew it going in. Why Buy the Other Nameplates? We looked high and low to replace our Honda Pilot this time last year. I saw the Outlook in a magazine and went to see it for myself. My wife wanted another Pilot. I wanted a larger Tahoe/SUV. (Glad we didn't go there now!) After the first year we can honestly say, it is the best automobile we have ever owned! But why would you want to pay more for the GMC/Buick sibling when they are made side by side in the same plant but are thousands more because of the name plate? I have suggested this SUV to many friends and all have six have purchased and all have great things to say. Shopped nearly all makes of crossovers and minivans to replace our aging Windstar, and couldn't be more pleased with our Outlook. Have not had any problems, it is a pleasure to drive, solid feeling, and very smooth on the freeway. Selected the XE with most options because we liked the interior appearance better than the XR. I also fell in love with the Enclave, but the price was more than we wanted to pay. We had to order our Saturn AWD with a 8 week delay, but it was worth it! I drive on some awful dirt roads down in Mexico and the Outlook handles very well. I do notice some reduced power going uphill, but does not affect the overall enjoyment of the ride. I'm getting 16 mph around town, which is what they advertise. I love having all the interior room and my 6' son has room to spread out in the 2nd row bench seat. And our three dogs enjoy all the room in the spacious cargo area. We're very happy with our purchase. Second time in 2 months we brought our Outlook in for a water leak. the first time, the rear sunroof leaked and absolutely soaked the carpets, mats, and center console in the front of the car. The second time, water was dripping from the driver's side near the side airbag hn to my wife's lap. We were told "don't park on an incline!" The back hatch door has no clearance, so it is wearing a groove into the rear bumper. We were told, "nothing we can do." The remote start didn't work for months. Plastic holding the seat belt was "razor sharp (Mechanic's words) and is cutting a groove into hard plastic interior surfaces. No more Saturns for us! Shopped really hard for crossovers to replace our aging minivan, but had trouble finding anything with as much room, until my wife fell in love with the Buick Enclave. Fortunately, our checkbook steered us to the Outlook! Much more affordable, even with leather seats and DVD. Enclave had softer ride, but lots of pricy "extras" that we really didn't need anyway. Acadia was in-between priced, but maybe even more truck-like. Our FWD Outlook has good MPG 22HWY and 20 mixed without much break-in yet. Still has good performance and power, quiet ride, transmission shifts well (not too picky here). I have only had my Outlook for a few months but love it already! 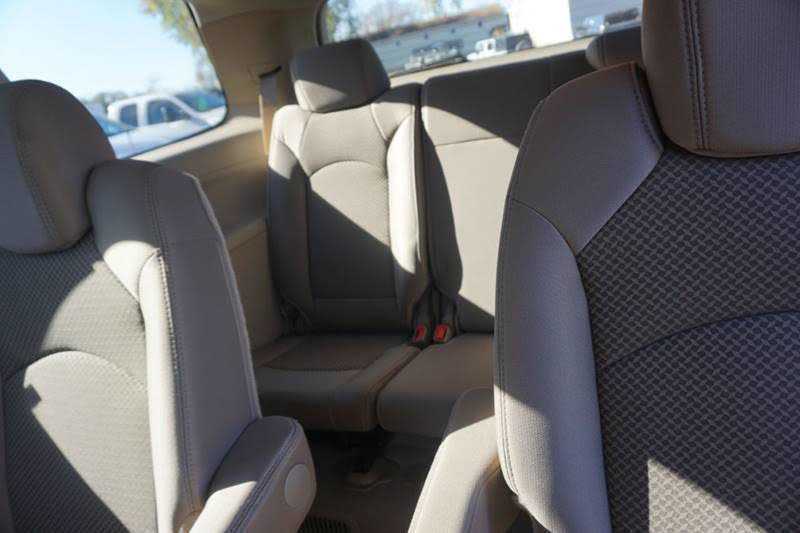 We are a family of four and needed something roomy, but wanted to avoid a mini-van at all cost, we found the outlook and it is great, there is plenty of room for the kids, and the back seating is not to bad either. There is a lot of space and overall great for a family of four..or five! The only problem I have or don't like is getting to the third row seating, it's a bit hard and I wish i would have opted for the captains chairs in the second row, but over all I love it! This is easily the best car I've owned. This vehicle handles great, is very comfortable and feels like a luxury car. We went with the Cocoa w/ black leather. Everyday we comments on this car. We can't get over how much room there is. It really does seat 8 comfortably. I had been looking for another vehicle for a while, considering both new and used. I pretty much tried every crossover before chosing this one - Nissan Murano (cheap feeling car), the GMC Acadia, the Buick Enclave and last I tried the Outlook. I made the right decision. I love to drive it, it is comfortable and the options are great. The ride is smooth, the view is great from all angles and the storage is almost as much as my full size Yukon Denali I just had. Love my Outlook! It's fun to drive and looks fabulous! I was tired of the minivan, so this is perfect! My kids love the double sunroof and DVD. It is the ultimate family vehicle. Saturn service has been great. Owned the Outlook for 1 year and have had no problems. Free oil changes and tire rotation! My only complaint is the mpg. My average is about 18; however, I drive about 80 mph on the freeway 90% of the time! The premium sound thumps! Love it! All my cars have been premium luxury cars (Cadillac, Corvette etc) and until now I would have never looked at a Saturn. Until now! This 2008 Outlook has changed my life in so many ways. I fit better than any other car or SUV on the market 9Escalade, Lexus RX, GX, Ford Edge, Explorer, Audi, porsche Cayenne etc) I can go on but no others compare. The Outlook overall is just an amazing tour de force of engineering, comfort, ergonomics, class and quality. The main reason I like this car is because it rides like an enlarged car not a modified pickup truck like most other sport utes out there. A V8 would be nice but not required. We needed an SUV that could tow our boat, seat the family and the dog comfortably, and not break the bank at the gas pump. The interior room on our Outlook is unbelievable, even in the third row of seats. Towing is competent, but lack of a V8's power is apparent. A remarkable amount of techno-goodies (hint: the Saturn is a much better value the way it is equipped than an Arcadia or Enclave). Won't win any prize for looks, but not bad, either. Gas mileage is a question mark. City driving we're getting about 14, highway better at 22- 24. Transmission is annoying, shifts back and forth on the slightest grade, although it seems to be getting better. Pefect family cruisemobile! I wanted to write and warn anyone who is considering the Saturn Outlook that this vehicle has been a nightmare for me and my family. We have had it for 5 months and it has been in the shop for repairs 6 times in the last 6 weeks. We have had water leaking, engine light on, engine running when the keys are out of the ignition, radio coming on when we are not in the vehicle, and finally the complete lack to start. Saturn has been very difficult to deal with and we are in the process of a lemon law claim. Our vehicle has been repaired several times with after market materials and it's always returned to us in filthy condition. I strongly suggest not purchasing a Saturn Outlook. I have driven a minivan and two Suburbans over the last 14 years. We were able to downsize as our oldest is going to college. This vehicle is a wonderful change of pace. I love the size, drive and features. I fill it with kids several times a week and it is very comfortable as well as easy to lay down seats and haul anything from girl scout cookies to landscaping material. We shopped both the Acadia nad the Enclave. Would have bought another Chevy but it has not come out yet. Huge selection at the Saturn dealership with the features we wanted. The look and space are amazing! We also own a Saturn Wagon SW2 and Saturn was always top of our list for a new car. We considered a Vue but fell in love with the Outlook. It's drives like a dream; quite, smooth, powerful. The interior is wonderful. We chose second row captain's chairs and all the seating is very comfortable. I am nearly 6' tall and one of my son's is 6' 2" and we drove as passengers in the third row with no issues. Plenty of leg room and head room. the Captain's chairs also allow you to really stretch out if needed. Of course the engine, handling, and operation are good, we expected that, but the storage is a true revelation. We also love the DVD player; high quality & fun. Purchased our new Saturn three weeks ago. We fell in love with the styling, and roomy interior. 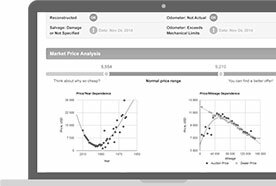 We have decided to use the exchange option that Saturn offers. With less than 1300 miles the car has developed camshaft problems, and a noise from the rear end every time we turn a corner. This 275 hp engine is not very strong when driving up hills. Its been in the shop three times in three weeks. If the exchange vehicle is not any better, we will probably never purchase another Saturn. The best and most comfortable, quiet car I have ever owned. We drive to Fl over 1500 miles, and I usually spend about eight hours behind the wheel! With this car I feel as though I could keep on driving all day and night. My only gripe is the gas mileage. I am hoping as I drive it more, that it gets better. I love my Outlook. I just took it to Montana from Colorado hauling a trailer. It did OK, a little sluggish in the wind, gas mileage suffered but very comfortable. I drove the entire 1800 miles there and back. XM radio came in handy. Looks great inside and out. I finally got the car other people look at going down the road. I absolutely love this vehicle. I traded in a 2000 Ford Explorer and I couldn't be happier. I was looking at the Acadia as well, but the Saturn was almost identical for a lower sales price, so it was a no brainer. It rides quite smoothly, and the 2nd row captain's chairs work nicely for my children. I'm getting about the same mileage per gallon on the Outlook as I did the Explorer. The remote start has come in handy on the cold mornings we've had recently. The dual sunroofs are my favorite option on the car. My one small complaint is that I wish the moon roof retracted into the roof completely and that the vents did not automatically come on when it is opened. I love my Saturn Outlook! Never owned a Saturn before and I will own more! It out performs any other car I have had on the snow and ice----which I have had a lot of opportunity to test with this crazy winter. I previous owned 2 Ford Explorers, a Ford Freestyle and a Ford Expedition. I went back to Ford when my Freestyle Lease was up---they tried to sell me a KIA--yuck. I bought the Saturn and I am so happy with it....it is roomier than the Explorer and the Freestyle. Although less comfortable seats than the Freestyle. The anti lock brakes and traction control have made it easy to get around while I watch other cars sliding all over in the crazy icy- snowy weather we have had. We bought this car for the advertized fuel economy and to buy American. I alway buy AWD, but thought FWD would be fine and thought mild increase in fuel economy would be good. Wrong!This car can't get out of it's own way in the snow. It's so heavy in the rear there is no weight on the front tires. Forget about pulling onto a street after a snowstorm. The MPG is 15.5 at best. You can get near the 24 on the highway if you don't exceed 65 MPH. All in all, 15.5 is not 16-24 that they advertize. I am a sad consumer when 2 of the three reasons I bought it were a fraud. I love everything about my XR. It is sweet to look at, it is even sweeter to drive. The sunroof and moonroof combination are a dream. Navigation system rocks. The auto-start is great with the heated seats being fired up when it is cold and the a/c being blasted when it is hot. Remote opening of the back hatch is very handy, pop it then pick up what you are loading and load it with ease. Captain seats in the 2nd row is a great idea, I tote a lot of stuff and people. I have put over 10,000 miles on it since October and I love road trips in it. I have tried out every channel on my XM and I love the fact that the radio downloads local radio stations so I don't have to search the airways. This is the best car I have ever owned and its a Saturn! I just came out of a loaded 2006 Range Rover HSE and I would have never even thought about a Saturn Outlook XR AWD but after test driving it, I fell in love with everything about it. It is so roomy inside, the styling is very up to date and it drives with so little effort. It doesn't look big from the outside, the profile is very low but don't let that deceive you, inside is spacious with room for 7. Its a little sluggish off the line but if you downshift you make up for that. My only complaint are the doors, they tend to close on their own after opening them, tough with kids but you over look it. A must buy! I recently purchased my Outlook in. I thought I was ahead of the game by purchasing an Outlook instead of the Toyota Sienna. My number one reason for purchasing the Outlook was the advertised fuel economy. I thought it was too good to be true and I was right. I have exactly 2,596 miles on the vehicle. I use the cruise control religously on the freeway with just myself in the vehicle going at the speed of 65mph and I can never get better than 20mpg. I also had the time to test the outlook driving in the city until I had to get gas with just myself in the vehicle at all times and the best mileage I got was 13 mpg. I am so unhappy. Next time I will rent a car before I purchase. I have to say I was upset that GM gave up on minivans. Their latest batch were pathetically ugly and I was looking forward to them replacing them. Then we were told no more minivans from GM. They were being replaced by the Outlook, Acadia, and Enclave. Not only that, but the price on these goes up 5K over the price of a minivan! Reluctantly, I went to check out the Outlook and Acadia and I was plesantly surprised by the quality and design. My wife liked them very much too. Since we have 3 kids under 4 years old we needed the room, so I bit the bullet and bought the Outlook XE. I don't regret my decision at all. Yes, It's Really a Saturn! Test drove GMC Acadia, Mazda CX-9, Chrysler Pacifica, bought a 2008 Outlook XR FWD. The Acadia didn't ride as nice as the Outlook and had a few rattles to it. One practically melts into the Outlook's leather seats. Nice leg room in 2nd row. The ride is smooth, but can be rather stiff over bumps. It is quiet--you can hardly tell the engine is running; road noise is minimal. The interior is handsomely designed and the amber lighting over the front seat console is a nice touch. Impressive fit and finish. Engine power is adequate, although it is not the quickest out of the gate. Transmission is smooth but is hesitant to downshift. Not bad gas mileage (18 cty, 21 hwy). Nice vehicle. Good job GM! We've had the Outlook for less than one month. I love driving it! (I traded in a minivan.) I had to have brake and windshield wiper fluid added already but I think it is because the levels weren't checked when I bought the SUV. It is fun to zip around in and feels so much sportier than my minivan. No longer a minivan driver, forever a soccer mom! Just made a 2500 mile trip and it was a pleasure to drive. I averaged 22MPG for the whole trip and it didn't tire my 68 year old body. This is the best car I have ever owned and should last me for all time. I had thought to get the navigation package but the OnStar is does the job as well. I have had my Outlook for over a week now and can't say enough about it! It drives smooth and is powerful on the road. Can't wait to wake up tomorrow for the drive to work! We love this car -- it's super roomy & luxurious. Handles like a car. We took 4 adults & 2 children in carseats with room to spare. Ive had this SUV for a little over 3 weeks and so far it's been exceptional. No concerns here. If your looking into getting a resonably priced full size suv than the Outlook is the way to go. Saturn really got it right this time! 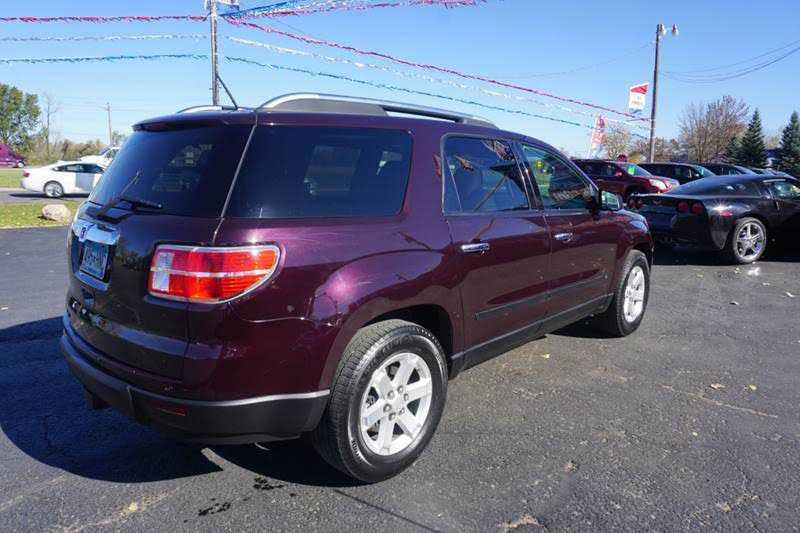 This vehicle doesn't just look good- it rides sooo smooth (better than the Acadia), has a lot of luxury features, and has lots of room (we have two small children and can actually walk around their carseats!). Gas mileage is great for a large SUV- I get about 17 city, 20-21 highway. I love the power liftgate, auto start, and the dual sunroofs are impressive looking. The interior looks very quality, and the overall vehicle feels very solid. Definitely Recommend! I had researched the Acadia and Outlook for months and was very excited when I finally purchased my Outlook XR fully loaded. The Outlook has a great look and I love the interior especially with the heated leather seats, sunroof, and captain chairs, Nav,etc...However I am extremely disappointed in the performance, there is no power climbing a basic hill, my foot is on the floorboard of the accelerator..The gas mileage stinks...I am averaging 12 mpg, I thought I was smarter than the Chevy Tahoe crew because the Outlook bragged about performance and good mileage..False ratings or something is dramactially wrong with this car...I drive rather conservatively, so I just don't get it. I was a little hesitant buying a Saturn but was sold on this particular vehicle. I've been very pleased with the vehicle refinements, comfort of the ride and initial quality. It lacks power, but power is something i'm willing to sacrifice for price. Gas mileage is decent. Lots of room. We were looking for a vehicle that wasn't a minivan and could comfortably seat 5. We've owned a Volvo for many years and looked at the XC90 first. The drive and room of the Outlook made far surpassed the Volvo. Drove a the big Toyota SUV and a Yukon- GM got it right with this crossover. This summer, a 1200 mile family road trip was the most enjoyable car ride in memory. Kids were happy with room, headphones, and plugs for games. Seats were comfortable, and we averaged about 20/gallon. I was hoping for a little better gas mileage (EPA states 24 hwy), but other than that, no complaints. I compared this to an Acadia, Pilot, Tahoe. The Outlook topped them all! It drove the best, had more options, and had the better price. I love it. I have the captains chairs in the back and I would never have one without them. My insurance went down $300 a year because of all the safety features. My husband is 6'2" and he has plenty of room. I have been getting so many compliments on the style of it. I love the OnStar, XM radio, and DVD player. All of the reviews are correct on line, you will love it! We bought the Outlook after purchasing an 07 Aura a few months back. We were so impressed with the Aura we figured we couldn't go wrong with the Outlook. We were right. It gets good gas mileage for a large SUV. The ride and interior are very comfortable. First time I saw it was during the 2007 car show in Houston. My wife and me, we were very impressed from the beginning. We didn't know which one to choose between the Acadia and the Outlook, we decided for the outlook because it has more of a luxury type inside. It's a lot of fun and comfort to drive it. My friends are also very impressed with it. I bought the Diamond White color one with the tan interiors. Excellent. We looked all over for a 7-8 passenger vehicle that met our needs. Since our family is growing we needed something bigger. 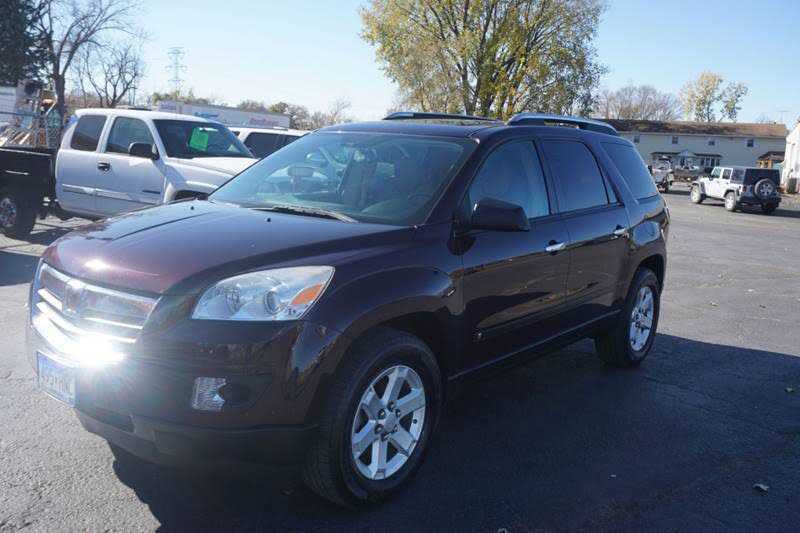 We looked at many other SUVs/crossovers and this is the best of the bunch for the dollar spent. My wife and I love this vehicle. It drives great and hugs the road for an SUV. We recently went on a 1000 mile trip and it was the easiest ride I have ever undertaken. he fit and finish is top notch (way better than my 2007 VW Passat Wagon) and I really like the exterior and interior design of the vehicle. After 2000 miles we are getting 16 city and 24 highway. We hesitated at first when considering Saturn but we could not be happier with our purchase. My wife and I considered just about every SUV and crossover on the market. We were both surprised to find ourselves in a Saturn dealer. Rightly or wrongly, we still considered Saturn to be a car company for first-time car owners, and especially not for high-end cars. We were very pleasantly surprised. We've only had the Outlook for a few days but are very happy with it so far. Car is wonderful. Gas mileage has increased wondefully as the car has climbed in mileage. Very quiet ride. Handles excellent. Way better build quality compared to older Saturns. I have finally found a car that I know I will not want to trade in within a couple of years. This vehicle has everything - comfort, style, safety, space. This is my 4th Saturn that I've owned and I'm convinced it will be my last! Well, at least until the kids are out of the house. It's a great size without feeling like you're driving a Semi down the road. An excellent vehicle for what it is intended for. Buyers need to know what they are looking for in a vehicle. The Outlook has great comfort, quietness, good ride quality, and luxury (XR). Steering has good feel and weight, but you are not going to carve canyons like a Porsche. This is a great looking and performing FAMILY vehicle with a good dose of luxury and it evidences quality. If you want 30 MPG, buy a CIVIC. This is an SUV and a dang awesome one. Ride is quieter than Lexus, interior awesome, rides like a dream. I drove an Acadia, Lexus GX, Toyota Sequoia. This vehicle has it all. Drives just as quiet and smooth if not quieter than the Lexus, styling is light years ahead of recent Saturn/GM models. They finally got it right, can't believe I haven't seen more on the road. We were excited going into this vehicle as we were anticipating the added room and fuel economy GM had advertised. We have fallen way below the mileage rating, currently getting in the mid 13's in town and around 18 on the highway. Total mileage to date is about 5,500. Asking the dealer about possible reasons for the bad mileage, we got a couple of responses...first it must be the way we drive, second, the 'break-in' period for this vehicle is 15K miles, both rubbish as far as we are concerned. I love my new 08 Outlook. It has the room of a van and the stylish look of an SUV. 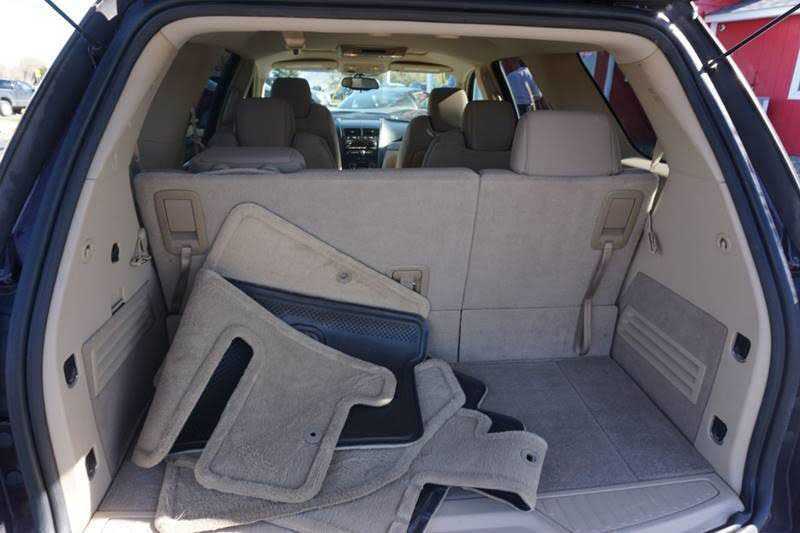 The seats are easy to fold for the younger children and any one who rides in the back has plenty of leg room. Road noise is non existent and the dual air controls for the back lets everyone have the temprature that they want. I recommend this vehicle to everyone who likes a nice ride.